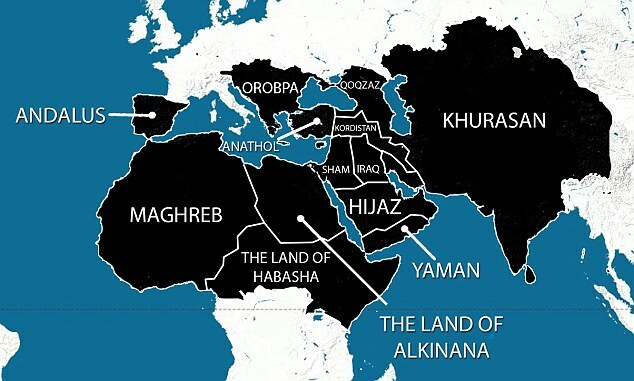 The jihadists terrorists of the Islamic State of Iraq and al-Sham (ISIS)– now trying to rebrand as simply the “Islamic State“– have released a new map that outlines the territory they aspire to conquer within the next five years. That territory spans from Morocco and Spain out to Sri Lanka and the border of China. 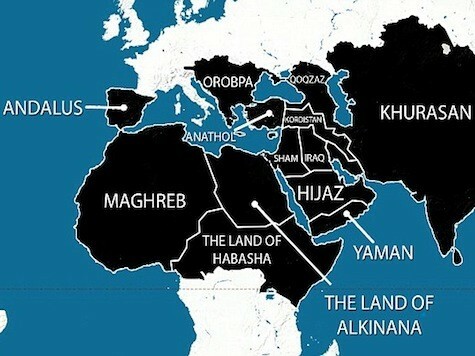 Since the map is not labeled using the political distinctions recognized by the rest of the world, it is unclear whether ISIS includes parts of China in their caliphate. Western China is home to millions of Muslims, many of the Uyghur ethnic minority. Uyghur separatists have been blamed for a recent string of terror attacks in Xinjiang, in the westernmost limits of the nation. ABC News notes that the map began to surface on social media as ISIS made strides in conquering cities in Iraq, and was most widely disseminated as the terrorist group formalized the announcement of the caliphate under their leader, Abu Bakr al-Baghdadi. The map is part of a larger propaganda effort meant in equal measure to attract Western Muslims to the cause of jihad and scare Iraqi and Syrian soldiers out of fighting against them. The former effort has resulted in a large volume of English-language multimedia, the product of ISIS’s press outlet, Al Hayat Media. In one video, a jihadist mocks President Barack Obama in English, asking whether he has “prepared diapers for your soldiers.” The other side to ISIS’s propaganda outfit are images spread over Twitter and other social media detailing the atrocities these jihadists commit. This week, the Syrian Conservatory for Human Rights, an NGO stationed in the region, confirmed that nine men had been crucified for not being extremist enough in their commitment to jihad. The images have made the rounds on the internet, as jihadists proudly pass them on the followers.